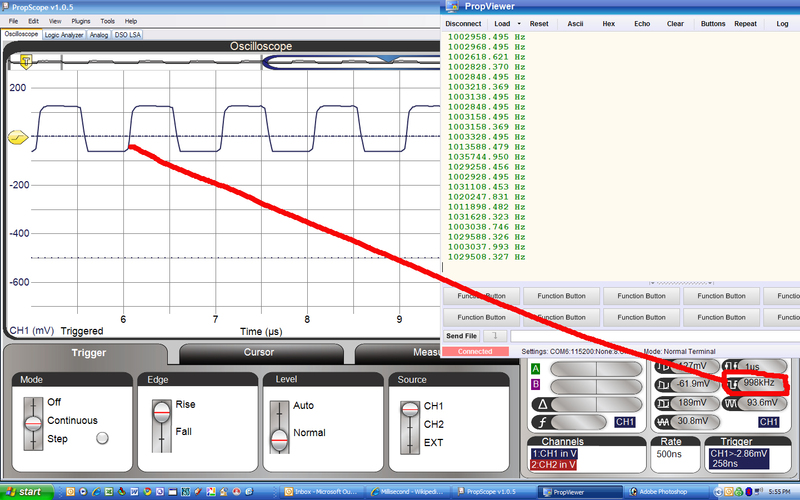 PropBasic: Reciprocal Frequency Counter (0.5Hz to 40MHz) 40MHz now !!! Someone had asked about a frequency counter. I wrote this one in PropBasic,itmeasures the frequency on P0 and sends ascii to a PC terminal program. It is good up to 40 MHz (a prescaler could be used for higher frequencies). It is a reciprocal counter, so the resolution is quite good even with a 1.0 sec gate time. 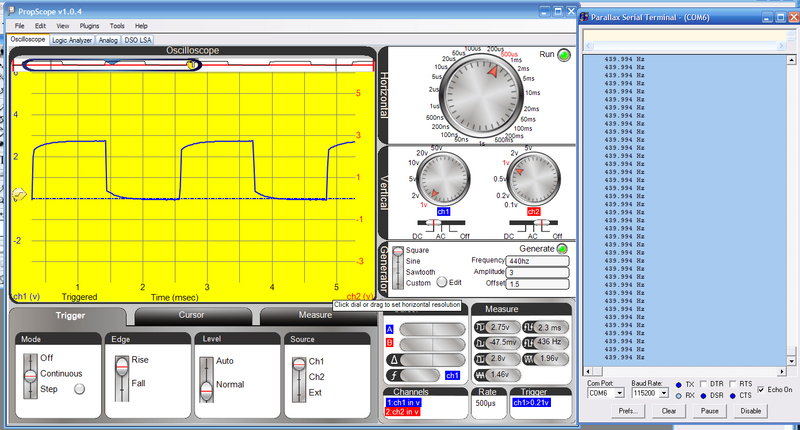 Posted "Freq Counter Simple" it is a standard counter. Very easy to understand. I tested the program with a few different freq.s, It worked great. I checked the accuracy against my BK Precision Freq.counter, Dead on the money. I actually get a reading from the PropBasic program and the bst Term.window faster then the BK can track in on the freq. and display it. hi Bean, thanks for the code. It works great. I don't understand when you "WRBYTE ascii(temp), digit"
you don't have to "RDBYTE ascii" to send it to the PC. Very un-scientific test because it was based on the PropScop Signal Generator. I can't rely on the product, although it says it's putting out the correct frequency and the scope input seems to correspond. But I can not trust this device as it took me 1/2 hour just to get it connected again and I needed to restart it multiple times just to get valid readings for this test. Bottom line, I work with a lot of audio stuff. All the readings from 440 hz up to 5kz are way off in the PBasic program. The closer I get to 1Mhz, the readings are closer. At 2mhz, they are almost spot on. I'd like to see if anyone has taken measurements in the audio range, (say 100Hz to 20KHz). I don''t have any of my equipment to do this for the next month. Again, this may be all associated with the PropScope not working properly. It's going into "Don't use untill fixed"drawer. · Looking at your first screen shot the output is only 0.221 volts peak-to-peak. That is probably not enough to properly toggle the pin of the propeller. Idealy you want a zero to 3.3V waveform with a nice fast rise and fall time. FWIW, I faked a 440Hz wave on P0 (NCO, $00005C46, @80MHz) and that's what I'm told by the program (439.994Hz in fact). So as Bean suggested it might be the signal level. The amplitude of your input seems really low to me.I don't have a propscope,so I could be reading the attched image's wrong. In my first test I started @ 100kHz and went up to 2mHz. I shot a 4volt peak DC square wave through a 220ohm resister to PIN 0 with a 10k pull down to clean off some of the A/C noise leaking from my older Function Generator. My Function Generator gets a little squarely below 5kHz,But I can use a BS2 to simulate some low freq.s with about the same signal I had from the Function Generator. I' ll get back later with my results! You can feel stupid by asking a stupid question or You can be really·stupid by not asking at all. The test started out at a higher voltage. I didn't noticed that they dropped during the tests. Had to drop back to PropScope Ver 1.04 to get any amplitude out of the Freq Gen. Supposed to do 0-5V. All I could get out of it was 3V, (which is fine for this test). Attached is good working 440hz test. I have been working through this code to get a better understanding of how it works. I think it's brilliant, But theirs one statement that has me puzzled.
" sigCnt = ___remainder "
I don't see "__remainder" declared as a VAR,CON,etc. and I didn't see it in the reserved words. Could you explain to me what that line of code does in your program? Thanks in advance for an explanation. __remainder is the remainder of the last division operation. But it MUST be assigned right after the division because it could be used by another command. I'll have to get it added to the documentation. I'm working on a tidy'er version of the program. ··· ' We can calculate the answer one digit at a time. ··· ' This we can do easily. Now the "trick" is how do we get the next digit ? ··· ' We take the remainder from the division, multiply it by 10 and divide again. ··· '· can get as many digits as we need until we run out of precision. I feel better now,I thought I was having another brain-fart. LOL!!! Most Importantly, thanks for ProBasic!!!!! I can't wait to see the new code!!!! You will notice that the posted code starts at the 10Mhz digit so the initial multiplication is * 8, but this digit will alway be zero since the maximum frequency is 2.5MHz. Also notice that the gate time does not affect the calculations. Only the precision of the result. You can just change the "LOOP UNTIL cntTime > 8_000_000 ' 0.1 Second gate time" line to use a different gate time. What blows my mind is that with the Propeller you COULD measure 8 frequencies at the same time. Pretty sweet for a $8 chip. I have posted the updated code in the first post of this thread as "Freq Counter2". ·Bean what is the osx file? What osx file are you talking about ? Very cool Bean. I'm seeing some issues on slow signals with slow rise times, but I suspect putting a schmitt trigger on the front end to clean up the input will make that go away. "I mean, if I went around sayin' I was an emperor just because some moistened bint had lobbed a scimitar at me they'd put me away!" I have changed the code to use a hardware counter for the counting. So now is good up to 40MHz. This is turning out to be a pretty nice project. Nice. One question: Why limit the display to 1mHz ? So, I'd suggest a double display, - a faster refresh one (1-10 readings/sec), and then a slower one, ~ 10sec update, that gives highest precision for drift. It might have been me that requested this. I just finished the Spin version with the help of JonnyMac and his object. Since all the hardware is still wired up on my bench it is the perfect time to try it out. The PropBasic code relies heavily on the Propeller chips counters and WAITPxx instructions. I don't think a direct conversion will work. You'll have to adapt the concept to the hardware and instructions that the PIC offers.